Apricot-scented ‘golden chanterelle’ and a new cousin sprout in East Texas. Maybe you cuss mushrooms in your yard. Not David Lewis. He gets down on his knees and examines them. Very carefully! In fact, last year the East Texas mycologist (a scientist who studies fungi) helped in describing a new mushroom species for the state. 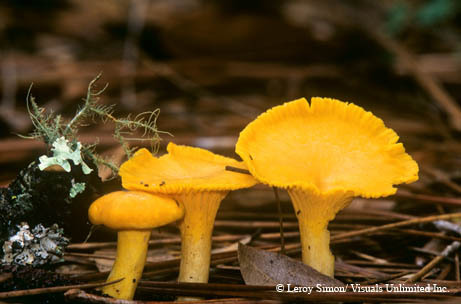 On a farm near Caldwell, Lewis and his colleagues found Cantharellus quercophilus growing from sandy soil in a post oak savannah. Two common species are Cantharellus cibarius and Cantharellus lateritius, which bear golden-yellow fruit in June and July across floors of mixed pine/hardwood forests. Fruit, you say? Some fungi feed off dead vegetation, while others attack living plants. Mycorrhizal fungi, such as Cantharellus species, give and take with tree roots. While the fungus saps sugar from the roots, it also produces beneficial phosphorous and nitrogen. 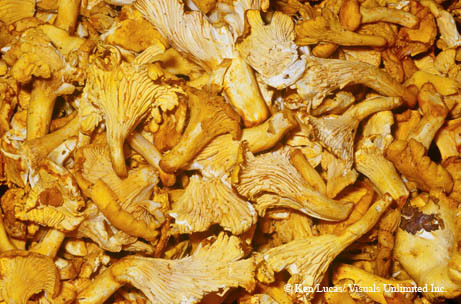 Sometimes called the “golden chanterelle,” Cantharellus cibarius mushrooms unfurl upward as they enlarge. The fruit — which smell sweet like apricots — are edible. But never gather mushrooms unless you’re with a mushroom expert, Lewis warns.